Here are Las Vegas horseback riding tours! Put on your cowboy hat and boots and go for a ride at either in Red Rock Canyon or in Nelson Ghost town, where the infamous Techatticup gold mine is located. These fun riding tours are a great way to entertain kids (7 and older), and make a great addition to your fun Vegas vacation! Travel along the Ol’ Spanish Trail by horseback and experience the Old West like never before. 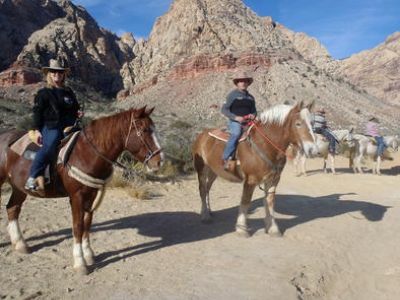 Your 5-hour Las Vegas horseback riding tour includes hotel pick up and drop off service and you will be taken to a ranch within the beautiful Red Rock Canyon, where you will take a relaxing horseback ride along the famed Spanish Trail. The Ol’ Spanish Trail was one of the original routes from Santa Fe to present day Los Angeles during the 19th century. The dusty trails will have you imagining of being in the Wild West as you explore a western style town complete with a petting zoo of animals. After returning to the ranch, be prepared to chow down on a tasty western style lunch that can satisfy the hungriest of cowhands. You are encouraged to wear long pants and appropriate shoes for this excursion. All horseback riders must be at least 6 years of age to participate as well as under 250 pounds in weight. 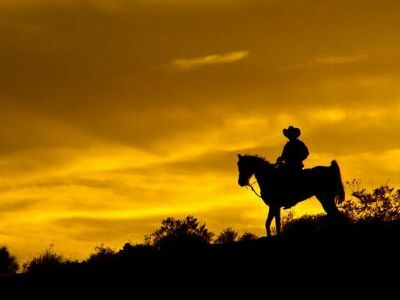 Engulf yourself of the beauty associated with the sunset within a picturesque desert setting and experience a tranquil Las Vegas horseback riding tour, before settling down for a cowboy cook-out. Transportation to and from your hotel is included in this 5-hour tour that first takes you to a ranch in the majestic Red Rock Canyon situated within Mojave Desert. After saddling up on your horse you will experience a one and half hour horseback ride through the beautiful natural scenery of a rugged landscape that will transport you back to the Wild West when Native Americans and cowboys ruled the area. On your return to the ranch and stables you will enjoy an authentic cowboy cookout that will include entertainment and plenty of food. All participants must be 6 years of age and weigh less than 250 pounds. Guests are more comfortable in long pants and closed toe shoes. Please bring a jacket if the weather dictates. This is an invigorating way to start your day when you decide on this Las Vegas horseback riding tour, accompanied by a delicious breakfast, that takes you through some of the most iconic landscapes in the American West. Enjoy complimentary pick up and drop off service to/from your hotel but first you will be driven to an authentic working ranch in the unique Red Rock Canyon. At the ranch you will eat a complete western style breakfast to help you through your one hour horseback ride. While on horseback you will view some of the most interesting and breathe taking scenery in the world. During your excursion you will have a chance to enjoy a petting zoo as well as an American West style town complete with entertainment. You will have plenty of time for photographs that will keep the memories fresh in your mind for years to come in the future. It is recommended for all guests to wear protective clothing such as long pants and closed toe shoes. All participants must be 6 years old and weigh less than 250 pounds. 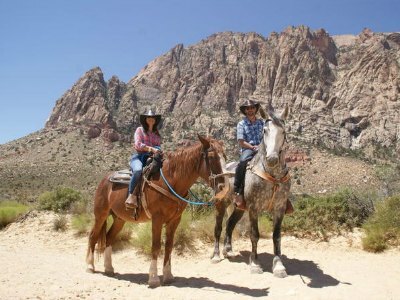 The 2-Hour Horseback Riding Tour through Red Rock Canyon is a superb way for visitors to spend a day in the beautiful natural landscape that surround Las Vegas. The 5-hour journey is perfect for all types of travelers and horseback riders whether you are a novice or expert. Your adventure begins with free pick-up service at your hotel where you will be driven to Red Rock Stables. At the stables you will meet your expert trail guide and the trusted stable hands will pair you with a horse that matches your riding ability. After a few quick riding technique lessons you set-out on the trail following your guide. Along the way your guide will tell you intriguing stories of Red Rock Canyon National Conservation Area as well as point out the wildlife and fauna which makes this a special place to visit. During your ride you will be amazed at the intricately carved rock formations that change in color from red to pink to orange as you travel through the weathered gorges of the canyon. After you dismount at the stables, you will be transported to your hotel where your cowboy-style Las Vegas horseback riding tour concludes. 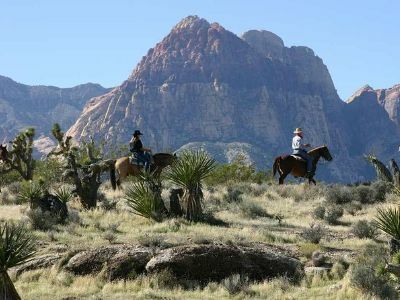 A unique way for people to experience the life of a cowboy, gaze at the beautiful natural landscape and enjoy a ranch-style barbeque dinner is to try the Red Rock Canyon Sunset Las Vegas horseback riding tour and Barbeque. 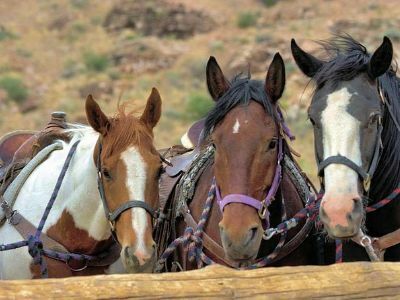 Your 5-hour horseback riding adventure is ideal for all walks of life as well as riding abilities and starts with free pick-up service from select hotels along the Strip where you will be driven to Red Rock Canyon Stables. At the stables you meet your genuine cowboy guide where stable hands will outfit you with all the necessary riding equipment and find the right horse for you based on your riding skills. Along the way on your 90-minute horseback there is plenty of wildlife to view as well as the rock formations of the Red Rock Canyon National Conservation Area and your trail guide will explain all the important sights. You will dismount atop a high mountain plain where you can gaze out over the brilliantly colored scenery that includes Sin City in the backdrop. As the sunsets turning the sky into a thousand pastel colors, you will head to the campfire where your cowboy chefs are preparing an authentic ranch-style barbeque complete with all the fixings. While you indulge in your meal there is plenty of entertainment that includes sing-alongs, cowboy poetry and live music. Your cowboy-style Las Vegas horseback riding tour concludes with drop-off service at select hotels.